Orlando (July 2, 2018) – Sena Hospitality Design Inc., an Orlando-based licensed interior design firm specializing in resorts, took home top honors in the Refurbishment of a Common Area – HOA category from four finalists awards at the ARDY Award Gala held during the 2018 ARDA World convention of the American Resort Development Association in Las Vegas. 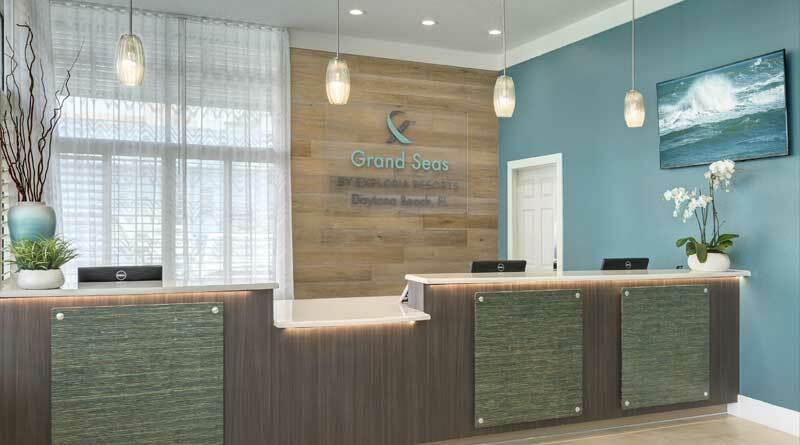 Winning an ARDY award was the refurbishment of the lobby at Grand Seas Resort by Exploria in Daytona Beach, Fla. Guests entering the resort are now greeted by a coastal, clean, and modern look. The beachy theme includes a wavy, seaweed-patterned carpet, artwork of the ocean floor, an acrylic panel featuring a sea turtle and metallic starfish accents. Also achieving finalists spots in the competition were three refurbishment projects: the units at Grand Seas Resort, by Exploria Resorts; a common area at Summer Bay Orlando Resort, which became Hello Coffee Shop; and a common area, also at Grand Seas Resort, that’s now Loretta’s Beachside Café. In addition to the ARDA awards, SHD recently received the TopID award, recognizing design excellence, from the Sunshine (Central Florida) chapter of the NEWH. This prestigious honor is determined by NEWH chapter and regional boards to recognize and promote the best in the industry. NEWH is the premier networking resource for the hospitality industry, providing scholarships, education, leadership development, recognition of excellence, and business development opportunities. In a demonstration of their appreciation for SHD’s work in 2017, Exploria has awarded the firm several new projects, including the refurbishment of 171 units at Grand Seas Resorts and the refurbishment of 153 guestrooms as well as corridors and the breakfast area at Crown Club Inn at Summer Bay Resort. Sena Hospitality Design Inc. specializes in interior design, purchasing, and installation primarily in the hotel and timeshare industries. Their mission is to create beautiful, cohesive interior environments for the hospitality industry, meeting clients’ budget, timeline, and overall goals. The firm is a member of the American Resort Development Association, NEWH, American Society of Interior Designers, and the Central Florida Hotel & Lodging Association. Visit senahospitality.com to learn more.